Kneel on the floor in Virasana. Clasp the inside of your left elbow with your right elbow with your right hand and the inside of your right elbow with tour left hand Now lean forward and place your elbows on the floor. Ensure that the distance between your elbows is not wider than the breadth of the shoulders. Release your hands and interlock your fingers to form a cup with your hands . Keep your fingers firmly locked, But not rigid. Place your joined hands on the floor. Press your elbows to the floor and lift your shoulders up, away from the floor (see inset). Exhale, and gently swing your knees upward in a smooth arc, until both your thighs are parallel to the floor. In this position, the entire upper body, from the head to the waist and hips, should be perpendicular to the floor. Do not move your elbows until you come out of the final pose. Place the bolster in front of the chair, with one end between the chair’s front legs. Place a blanket on the bolster. Drape the mat over the chair’s front edge and place the folded towel on the mat. Step your feet through the back of the chair, and sit down. If needed, tie a yoga belt round your legs to keep them together. Hold the sides of the chair back and slide your hips toward the back of the chair until your buttocks rest on the back edge of the chair. Exhale, and lift your chest, arching your entire back. Lower your torso, ensuring that the folded towel supports your lumbar spine. Place your crown on the bolster. Ensure that your lower back rests on the front edge of the seat. Insert your hands, one at a time, through the chair to hold its back legs. Do not press your head down on the bolster. Keep it perpendicular to the floor, as tilting the head too far back strains the neck and throat. Close your eyes. (Beginners must keep their eyes open to avoid disorientation) Straighten your legs to increase the stretch of your back. Hold the pose for 30-60 seconds and with practice, for 5 minutes. 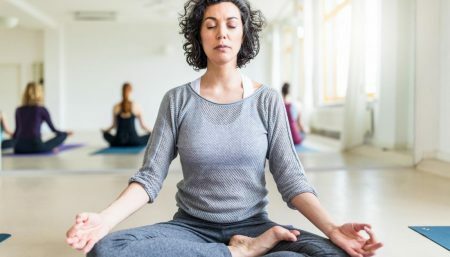 Sit in Dandasana . Place a bolster behind you, its short end against your buttocks, and place a folded blanket on its far end. Place 2 wooden blocks on their broad sides on either side of your hips. Bend your knees, and join the soles of tour feet together. Draw your heels toward your groin. Buckle the belt and loop it over your shoulders.Bring the belt down to below your waist. Pass it under both feet to stretch it over your ankles and the insides of the thighs. Move your feet closer to your groin. The belt should feel neither too tight nor too slack, so adjust the buckle accordingly. Make sure that the end of the bolster touches your buttocks. Position a block under each thigh. Place your elbows on the floor, and lower your head and back onto the bolster. Make sure that the bolster comfortably supports the length of your back and your head. Your spine should be on the center of the bolster. Stretch your arms out to the sides, with the palms facing the ceiling. Relax, and extend your groin out to the sides. Feel the expansion of the pelvis, and the release of tension in your ankles and knees. Initially, stay in the pose for 1 minute. With practice, increase the duration to 5-10 minutes. Once you lower your back onto the bolster, rest the pack of your head on the rolled blanket. Keep your chest fully expanded. Press your shoulder blades down on the bolster to lift your chest. 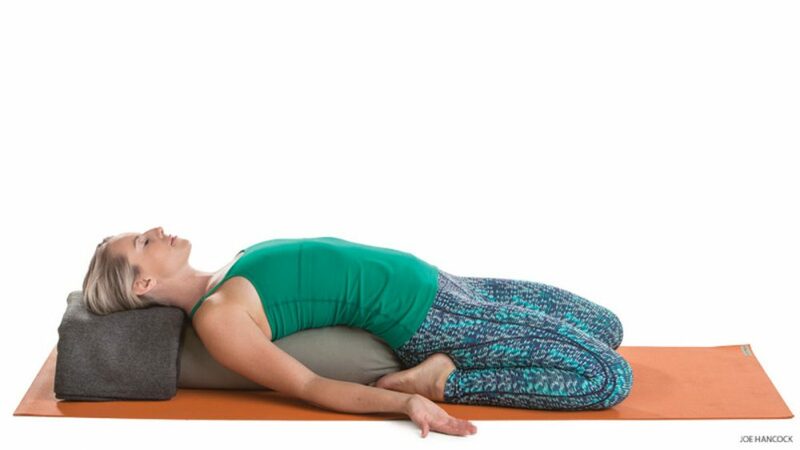 Extend your toes and ankles toward the bolster. Push your feet closer to your hips with your hands. Extend the pelvis, and press your thighs close together. Move your arms out the sides, with the palms facing upward. Extend your neck, but keep your throat relaxed. Drop your eyelids down gently. Experience the relaxation of the thighs and the abdomen, and the lift of the chest. Feel the continuous stretch from the cervical spine to the tailbone. Initially, stay in the pose for 1 minute. With practice, increase the duration to 5-10 minutes. Lower your back onto the mat, supporting your torso on your palms until your head rests on the mat. Bend your right knee, and bring it to your chest. Keep your left sole pressed against the wall. Loop the belt around the sole of your right foot. Hold one end of the belt in each hand. Make sure that your hold the yoga belt as close to your foot as possible. This opens your chest, and keeps your breathing regular and even. Keep your extended leg pressed down on the mat. Inhale and raise your right leg until it is perpendicular to the floor. Hold both ends of the belt with the right hand. Place your left arm beside your left hip, Press the left foot against the wall, and the left thigh on the mat. Stretch your right leg up further, simultaneously pulling your toes toward you with the belt. Feel the stretch in your right call. Keep your left leg firmly pressed to the floor. Do not bend either knee or allow the left leg to tilt out. Initially, stay in this position for 20-30 seconds. With practice, increase the time to 1 minute. Repeat the pose on the other side. Sit on a folded blanket, with your spine erect and your knees bent, Position the blocks on their broad sides on either side of your hips. Then place your palms on the blocks. Sit on your buttock bones. Straighten each leg, one at a time, and join the inner sides of your legs and feet. Lengthen the calf muscles, and stretch your knees and toes. Keep your knees straight. Press your palms down on the blocks and stretch your elbows and arms. Lift your abdomen, freeing the diaphragm of tension. Hold the pose for 1 minute. Beginners may find it easier to separate their feet slightly, and should hold the pose for just 30 seconds. Spread a mat on the floor and place a folded blanket on it. Then sit in Dandasana on the blanket. Bend your right knee, so that the sole of your right foot touches your left thigh. The right heel should rest against the groin. Loop the belt around your left upper heel. Pull strongly on the belt and lift the torso. Straighten and stretch both arms. Press both thighs and the bent knee down on the floor. Tighten your grip on the belt, and stretch your spine up. Tilt your head back, breathing evenly. Hold the pose for 20-30 seconds. Repeat the pose on the other side. Exhale, and lift kneecaps. Bend forward, extending your spine, and bring your torso down toward the floor. Look up as you bend to ensure that your back is concave. Take both hands off your hips, and lower them to the floor. Place your palms flat on the floor with your fingers spread out. Widen your elbows, keeping your palms flat on the floor. Place the crown of your head on the floor, between your palms. Push your stemum forward and draw the abdomen in. Move the thighbones and groin back to reduce the pressure on your head. Stay in the pose for 1 minute. Stand in your bare feet on a smooth and even surface. Keep your feet together, with your heels touching the wall. Beginners may find it easier to keep their feet 5 cm (2 in) apart. Stretch your arms along your sides, with the palm facing your thighs, and your fingers pointing to the floor. Stretch your neck upward, keeping the muscles soft and passive. Distribute your weight evenly on the inner and outer edges of your feet and on your toes and heels. Tighten your kneecaps and open the back of each knee. Turn in the front of your thighs. Tighten your buttocks. Pull in your lower abdomen, and lift your chest. Stand in your bare feet in Tadasana on an even, uncovered surface. Exhales, and stretching from your waist, lift your arms in front of you, to shoulder-level. Keep your palms open and facing each other. Stretch your arms further up from your shoulder, keeping them parallel to each other. Extend your wrists, palms, and fingers toward the ceiling. Feel the stretch along both sides of your body. The prolapse of any organ is a very difficult problem to treat without surgery. Once the muscles and tissues that normally hold an organ in place have weakened and lost their structural integrity, it is very difficult to get them to return to their normal state. If the prolapse is very mild or minimal, there is a much better chance of reversing the condition.